People have been fishing with jigs for 100’s of years and they work better today than ever before. They’re probably one of the oldest artificial lures ever used. They’ve been around forever, but how do you actually fish with a jig? Amateur anglers across the country seem to start out following the same basic path. They start out fishing with worms, then move towards soft plastics and jigs. Most of them never fully master jigs before moving onto hard bodied lures. This really is a shame, because jig fishing absolutely changes the game. Once you master the jig, you transition out of that beginner stage. Everybody knows that jigs catch a ton of bass. Throw out a jig and you’re sure to catch a big fish. For some reason big bass really prefer a jig over everything else. They just look so natural compared to other lures. There are so many different kinds of jigs designed for all types of applications. There’s swimming jigs, football jigs, heavy duty flippin jigs, ETC. They come in lots of different shapes and sizes, but for the most part I prefer a jig that have a nice sized arky style jig head. That nice flat sided head makes them perfect for skipping under docks and behind cover. With all those different variations it’s tough to separate the different styles. Honestly, unless you’re a pro you won’t really see much of a difference. They’re all great for working into heavy cover, against shorelines, laydowns, and flipping them under docks and into grass. Swim Jigs: In recent years swim jigs have become extremely popular. Most guys use them just like a spinnerbait ripping them through the water column. Casting Jigs: Casting jigs normally have a arky style head so they stand up off the bottom. They’re really versatile and can be used in a wide variety of applications. Flipping Jigs: Flipping jigs are designed with serious weed guards so they can be ripped through heavy brush and grass. Most of these jigs have really thick hooks with firmer bodies. Football Jigs: As the name implies football jigs have a head that looks like a sideways football. These are meant for dragging along rocky bottoms so they don’t get hung up. Finesse Jigs: Use a finesse jig when you’re going after spooked bass. These small unintimidating jigs are perfect on pressured lakes and cold sluggish days. There are so many different ways and places to fish a jig. You can basically fish them all year round for a wide variety of fish. Everybody brings out their jigs during the spring and summer, but they work just as well on those cold fall and winter days. Winter time is perfect for those big bulky jigs designed to be fished through heavy cover. On those cold days bass really prefer a big bulky bait as opposed to smaller rigs. Throughout the spring I typically work jigs around shallow water cover and slowly transition towards deeper points/structure as summertime rolls around. Around the spawn they’re absolutely deadly in shallow cover, where these fish are staging up to spawn. Look for those rods with a really heavy action that gives you a little extra leverage. When I’m flipping around heavy cover, with these big heavy-duty jigs, I go with a 7’6” to 7’11” rod with a heavy action. When you’re fishing a jig you want to fish them on big stiff rods with even stiffer actions. You have to be able to drive that hook through the weed guard and into his mouth. Obviously a weed guard is going to help keep a jig from getting hung up in the grass, but some of us are asking to much. When you’re flipping a jig into thick grass it’s gonna get hung up occasionally. There’s nothing you can do about it, other than changing up your technique. Most of the time weed guards are going to keep your hook from getting hung up in the logs and stuff if you have the right technique. What I like to do with jigs is flip them into those hard-to-reach places that everybody else ignores. Flip them in the middle of a laydown, up under a dock, in those shady holes ETC. Those are the spots that nobody really gets to. I’ll skip that jig way up underneath and slowly work it out. Bass can’t stand it, you’ll get those big reaction strikes. The technique I use to work a jig is really simple. Originally jigs were designed to imitate a crawdad (some modern designs look like other forage species). Think about how crawfish scurry along the bottom of lakes and rivers. Thats how you want to work your jig. Work them along the bottom of the water and flip that jig out there. Patience is key, let it go all the way down to the bottom. After that you’ll basically lift the rod tip up and drag the bait. You aren’t moving the jig with the reel, you’re moving it with the rod. It’s really similar to worm fishing! You just move the bait with the rod and reel up that little bit of slack. Repeat the process, moving your jig along with the rod all the way back to the boat. Using the tip of your rod allows you to get a feel for the bottom and work around cover. The great thing about a jig is that you can fish them in those hard to reach places. It’s so weedless that you can work it into heavy cover that you normally can’t reach. It’s almost completely weedless, coming out of snags really well. Everybody has there own way that they like to rig up a jig. 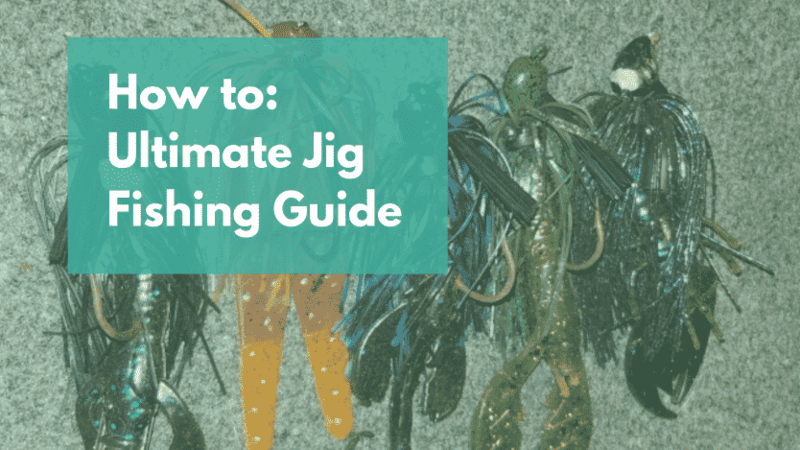 How do I like to rig up my jigs? Most jigs look pretty similar out of the box, with slight differences. The all have a hook/skirt (ETC) so you have to do something to make them work really well. Doesn’t matter where you’re fishing you want to put a trailer on the jig. I like to use those big creature baits as trailers. I like to match them up to the color of my jig. I’m going to fish a dark jig, blacks and blues, in darker muddy water. In clean and really clear water you’ll go with a lighter more natural looking style, like your browns and greens. I will literally thread the trailer into my hook trying to make it compact. That way the trailer is buried up in the skirt with only the legs hanging out. Some guys like those loose larger profiles, but I’ve always found tighter styles look more natural and improve your hookup percentage. What Type of Line Should You Use? Personally I like to fish a flipping style jig on heavier line. With such a stiff rod you’re going to really rip through that weed guard and drag bass out of cover. Normally I’ll go with heavy 15-20 pound test fluorocarbon line, but that depends on my situation. Sometimes when I’m working heavy grass I’ll start to throw straight braid to give me a little more oomph. You’re going to be flipping into heavy cover and working around cover. Dragging out those big bass from cover is harder than you think.